I have been thinking about my wardrobe quite a bit lately. I am getting annoyed with much of it. I am tired of everything in my closet. There is a lot that doesn’t fit, since I have had my kids and as I work from home, I haven’t needed to update much of it. I have picked up a few things here and there, but I know I am not always the most fashionable and, honestly, I don’t really like clothes shopping. It takes more time and effort than I am willing to put in and in the end usually costs more than I want. 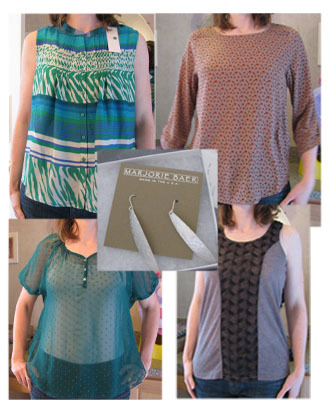 When I heard about StitchFix, I had to give it a shot. StitchFix is an online service where you answer several style preference and sizing questions. There is a $20 service fee for StitchFix to gather a box of 5 options for you of a variety of pieces. Once you receive the box you have 3 days to try on the items and decide if you want to keep them or send them back (and the $20 is credited toward your purchase). My first box arrived today (a day earlier than expected) and it proved to be quite interesting. What did I get? 2 shirts, 2 tanks and a pair of earrings. What’s going back? Everything except one of the tanks. These were items I would never pick out on my own. Each of the clothing items comes with a little “How to style this” card – suggestions to pair it with a skirt or jeans or whatever. That’s really helpful! The earrings are very cute but between my hair and little grabby kids, I avoid the dangles. The green tank I thought did nothing for me – this one I was least impressed with. The longer sleeved shirt had a cute print on it (cars, nuts and bolts) but I wasn’t crazy about the material. I felt like those first two and the green chiffony shirt were more maternity style! So yeah, I am passing on those. I like comfort, but not the billowy-loose stuff. It has taken me years to get comfortable with clothing that fits! The grey tank with the leaves down the front I liked right away – comfortable fabric, I thought it looked ok when it was on as well. The price was not outrageous – maybe a bit more than I would usually spend, but not out of range of say, the Gap or J.Crew.